Thu, Dec 6, 2018, 01:53 pm SL Time, ColomboPage News Desk, Sri Lanka. Dec 06, Colombo: Toppled Prime Minister of Sri Lanka and the leader of the United National Party (UNP) Ranil Wickremesinghe said the country should be governed by a government, not by an executive President and a new Parliament should be established to abolish the Executive Presidency through a referendum. The UNP leader made these remarks speaking to a packed audience at a seminar organized by the Professionals for Democracy titled "Constitutional Coup and the Repercussions' held at Galle Face Hotel, Colombo yesterday. 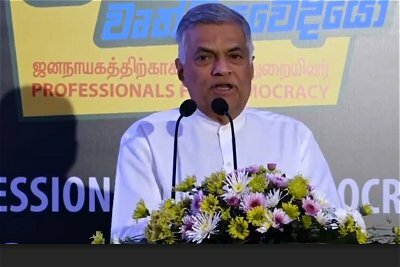 Speaking in English first, Wickremesinghe said the "current political crisis has made us truly Sri Lankan where we all got together, not thinking of race, cast or creed." It's an occasion when our fundamental right of democracy is at stake and we are fighting together." Switching to Sinhala the ousted Premier said they expected a democratic governance but the action by the President on October 26 shocked everyone. "We all got together and made a hopper. We expected democracy, probe corruption, development and, reconciliation... the step taken on October 26 surprised many, lost trust. We wondered how the candidate we voted for could take this action." The UNP Leader said they initiated this journey to create a healthy society but they had shortcomings and the journey was not fast enough. He said on the night of October 26 he thought he should spend the night at the Temple Trees, since he had spent only two nights at Temple Trees after he was elected Prime Minister. However, the next day he saw that the people were not willing to give up this fight, not for an individual or a party. He said the people were ready to fight for their rights and in order to develop the country. "For the past three years, we have built up a new framework for strengthening democracy. We were able to protect the independence of the law. Therefore, these organizations are working strongly today. We need to strengthen these institutions further. We are saying to act according to the constitution." The UNP leader added that the President's power should be pruned further while strengthening independent institutions established through Parliament and there should be limits to the powers of the government. "There should be limits on the powers a government can have. We need to create limits to the powers. We need to establish a system to appoint, justices, attorney general, police chiefs. They should be appointed according to that system," Wickremesinghe said. He said in the past court cases were spoken of over the mobile phone, and asked what should be done about it. He said after 2015 neither he nor his ministers have spoken to any judges and that was because of the strength that all institutions hold independently after being appointed by Parliament. Referring to the statement made by President Maithripala Sirisena that he will not appoint him as the Prime Minister even though all 225 MPs request him to do so, Mr. Wickremesinghe said he is not bothered. "That's not my problem. That's his problem," he said. He stressed that the country is governed not by the President, but by the Prime Minister and the cabinet. "Country should be governed according to the Constitution." He said the future journey is not only for defeating this coup but to ensure the right for democracy and requested the audience to organize a Jana Bala Meheyuma and support the campaign. "I was called a political curse, I was ridiculed, criticized and scolded. I reject all of that. I will give a reply thorough my culture." Narrating a story in Buddhist scripture, the UNP leader said like the Buddha rejected the brahman Akkosaka's scolding and curses he will also reject the President's criticism. "I will also not accept the criticism and ridicule from President Sirisena. I will not scold him or criticize him and he can take back all that he has said thereafter," Mr. Wickremesinghe said.